Hello everyone, today I’m going to be doing a ladies DKNY watches review followed up by features 6 of their most popular watches that are currently available. In today’s DKNY watches review I’ll be covering a few points about the history of the brand, the quality of the watches, and who actually makes DKNY watches. Is DKNY A Good Watch Brand? DKNY or Donna Karan New York as it’s also know is an American fashion brand that began back in 1984. They originally started off selling clothing but ended up making the natural progression to accessories which of course included a large range of watches. DKNY is a leading brand for designer clothing and accessories with a huge popularity around the world. So to answer your question; are DKNY a good brand? I’d say it has to be a yes. You can learn more about the brand on the DKNY wiki page. Are DKNY Watches Any Good? Next up we’re wanting to take a look at the overall quality of DKNY watches by answering the question, are DKNY watches any good? The DKNY watch collection focuses on offering a wide selection of styles and designs to their customers. The watches often combine elegances and functionality to produce beautiful affordable watches that double up as fantastic jewellery pieces. DKNY pretty much focus on women’s watches, whilst you will find a few men’s DKNY watches available they will be in the minority. Their watches tend to be affordable with pretty designs that are aimed at people who are after a watch more for its looks than anything else. These affordable DKNY watches are still well built, just don’t expect extremely high water resistance ratings or shock resistance etc. It might come as a surprise to learn that DKNY watches are actually made by the Fossil Group. It turns out that Fossil actually produces watches for a huge range of brands including Michael Kors watches, Marc Jacobs, Burberry watches, and Armani Exchange watches. 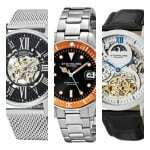 You’ll find the quality of the build of most of these designer watches to be on a par with each other. 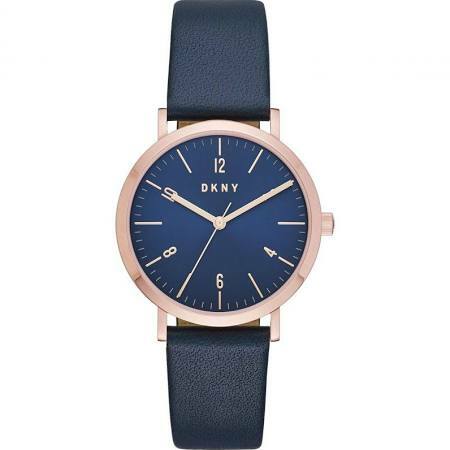 Below I’ve featured 6 popular DKNY watches that are currently available. 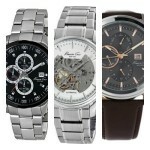 This is intended to give you a small example of what’s available from this designer watch brand. If you have any questions about any of the watches featured below just comment at the end and I’ll try and help you as soon as I can. First up on today’s list of the best DKNY women’s watches is this popular pretty timepiece from the Crosswalk collection. 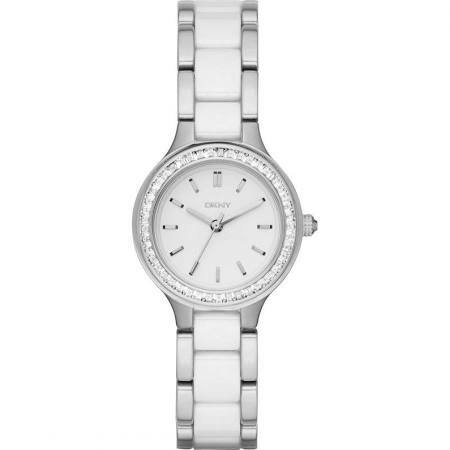 The casing of this ladies watch is made from stainless steel with a tonneau shape. The diameter of this casing is 28mm and has a thickness of 7mm. The strap is also made of stainless steel and comes in a crossover style bangle/bracelet and fastens with a jewellery style clasp. The dial of this DKNY women’s watch has a sleek white finish to it with silver coloured hands and hour markers for a simplistic finish. Powering this DKNY watch is a Japanese made quartz movement for both reliable and accurate timekeeping. A mineral crystal glass protects the front of the watch from scratches and shattering. This timepiece also has a basic 30m water resistance rating. You can read my full NY2234 DKNY watches review here soon. Up next in our DNKY watch review is this SOHO attractive looking timepiece. It’s built with a rose gold PVD plated stainless steel casing that has a 34mm diameter and a thickness of 9mm. The strap is made of a soft genuine leather in grey and fastens with a buckle style clasp. The dial has a grey coloured background and features these slim PVD rose gold coloured baton style hour markers and watch hands. There’s also the DKNY logo at the 3 o’clock position. At the heart of this Donna Karan watch is a Japanese Quartz movement that’s known for reliable and accurate timekeeping. A mineral crystal glass has been specially hardened to give you a good level of scratch and shatter resistance. This watch has a 50m water resistance rating which is handy to have. You can read my full NY2341 Donna Karen New York watch review here soon. Here we have another beautiful ladies DKNY watch. It features a stainless steel casing that has a diameter of 30mm with a 10mm depth. The dial is accented with a channel-set crystal top ring which stands out brilliantly. The strap is made from a combination of white ceramic links that are connected to a stainless steel bracelet. This fastens with a push release fold over style clasp. The dial features a white background with a simple design of silver coloured baton style hour markers and watch hands as well as DKNY written below the 12 o’clock position. 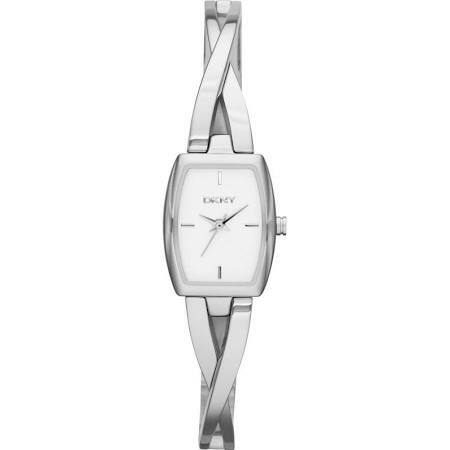 This ladies DKNY watch is powered by a reliable and accurate Japanese quartz movement. The glass has been specially hardened giving it a good level of resistance to scratches and shattering. This model also has a 50m water resistance rating. You can read my full NY2494 DKNY watches review here soon. 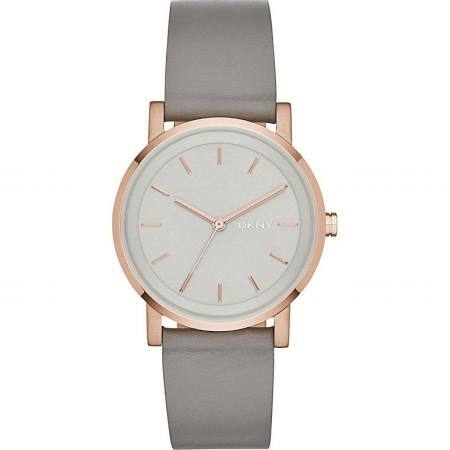 In at number 4 with have this DKNY women’s watch that really stands out on your wrist. 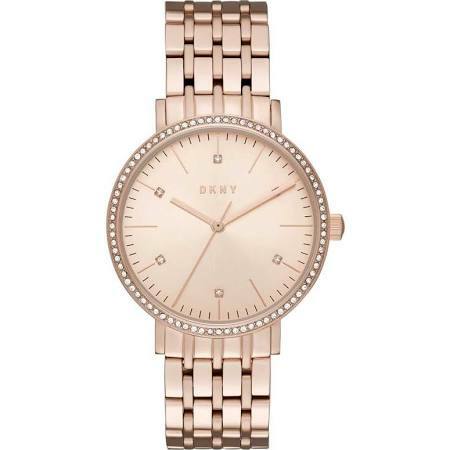 The DKNY Minetta watch is made with a stainless steel casing that’s been PVD rose gold plated. It has a 36mm diameter with a thickness of 8mm making it quite a slim watch. The strap comes in this beautiful blue colour and is made of a soft genuine leather. It fastens with a buckle style clasp. The dial again features this wonderful blue colouring that goes really well with the rose gold coloured detailings of the hands and slim baton hour markers. I’m quite a big fan of this combination of colour and it’s a bit different from the rest of our list so far. The Minetta DKNY watch is powered by a Japanese made quartz movement. This is an accurate and reliable movement that requires very little maintenance. A specially hardened mineral crystal glass gives you a good level of shatter and scratch resistance too. Like the previous DKNY watch, this model also has a 50m water resistance rating. You can read my full NY2614 DKNY watches review here soon. 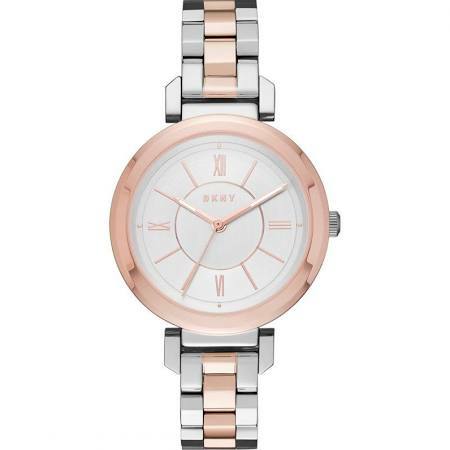 Here we have another stunning DKNY watch from the Minetta collection. It features this large 34mm rose gold PVD plated stainless steel casing that has a thickness of 8mm. The strap is also made of stainless steel with a PVD rose gold plating and fastens with a push release fold over clasp. The dial is finished in a rose colour with slim hands and hour markers, there are also 6 crystals for decoration. The bezel comes in a stone set finish which gives the watch a bit of a luxurious look. A reliable and accurate Japanese quartz movement powers this ladies DKNY watch. A mineral crystal glass has been used to give you a good level of scratch and shatter resistance. This DKNY women’s watch also has a 50m water resistance rating. You can read my full NY2609 ladies DKNY watches review here soon. Last up in today’s list of the best DKNY watches for women is this tremendous analogue watch from the Ellington collection. It’s built with a two tone stainless steel casing with PVD rose gold plating and has a diameter of 34mm with a slim 7mm depth. The strap also has a two tone finish with a mixture of polished stainless steel and PVD rose gold plating. It fastens with a fold over push release clasp. The dial comes in silver with rose gold coloured hands and slim hour markers which give it this brilliant high end finish. The hour markers are a combination of slim batons and Roman numerals. 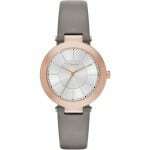 This last DKNY ladies watch is also powered by a Japanese quartz movement for accurate and reliable timekeeping. Protecting the dial is a specially hardened mineral crystal glass for a good level of shatter and scratch resistance. This ladies DKNY watch has a 50m water resistance rating. You can read my full NY2585 DKNY watch review here soon. 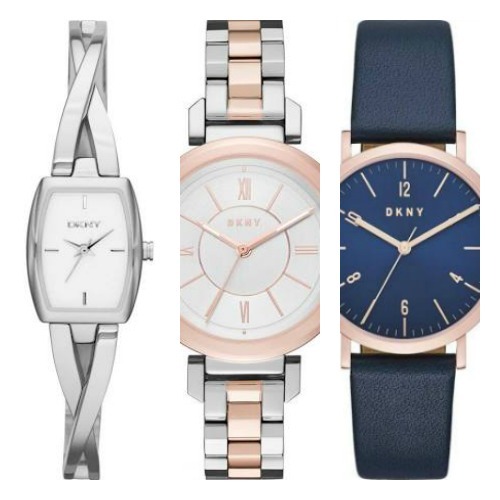 Thank you for taking the time to read through today’s list of the most popular DKNY ladies watches and our brand review. What was your favourite model? Comment below and let me know.